[ * - Hardcoded fix ] 1 - Some SURTASS has been fix. 2 - All Torpedoes: Behavior regarding biologic objects has been fix. 3 - All Torpedoes: Behavior regarding Mobile Decoys has been fix (Recognition as false target by logic level possibility of torpedoes ). 4 - Spearfish User and AI torpedoes: Fix bug with low speed in passive mode (Terminal phase). 5 - Frequency Profiles for Mobile Decoys has been reworked (Ability to determine the bait from the boat in the classification). 6 - Passive Sonar Model has been changed. Also, DEMON Station will work now only in the presence of a signal. * 7 - Broadband Sonars: improved sound visualization of platforms noise in backgroung. * 8 - Victor-II SSN User: 65-76 torpedo max.depth launch has been fix. * 9 - LandBased SAM and SSM Sites doctrine has been fix. 10 - Some AI Passive sensors rewrite for respecification. 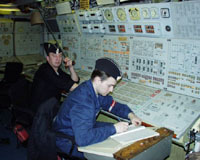 11 - Lost sound file for 5 kts order for russian subs (english voices) - fix. * 12 - Radars mechanics has been reworked.The contrast of the mark on the display has been increased. * 13 - Kilo Interfaces: rotating indicators for the course of bearing of distance - were replaced by more readable. 14 - Improved Kilo: Passive sensors has been replaced (Improved Sensitivity). 15 - MG-74 Korund: Active Sonar, Detect range has been significantly reduced to 500-600 m. 16 - SSM Sizzlers (CLUB) missiles fix. (AI and User) 17 - SAM missiles For Controllable Ships and AI platform fix (Doctrine). 18 - SAM Missiles fix default bug, when missile never fly with max.speed * 19 - Ohio Campaign has been fix. 20 - Subbase Land Object added (large location). 21 - Arley Burke DDG 3-D model has been replaced. 22 - AI Towed CM: replaced 3-D model. 23 - Acoustic voice messages: transient reports are now dependent only on passive sonar. Splash Buoy message, range reduced to 1 nmi. 24 - Fix bug, when the message about the transition process could come from the baffle area for passive sonar. 25 - Fix ranges about undersea missile launch (transient process) message, depending of missile type . 26 - Helo sonars: Active Dipping Sonar - sensitivity has been reduced. Sonic cue echo return has been increased. * 27 - User Helos: Dipping Sonar Station - small rework display control (NMI scale instead meters). 28 - Sirena Device: re-restored to database. 29 - Frequency profile 100 for the second line has been corrected to 105. (eliminates washout frequency on the hull sonars). 30 - Type 094 (Jin SSBN) AI platform added to China. 55 Hz and 65 Hz for torpedoes. * - third frequency - it is not tied to any class – DDG, FF or CV, as it is in the default game sonar profile. Only ACTUVs and DSRV tied to unique class. * - fourth frequency - it is not tied to any class – DDG, FF or CV, as it is in the default game sonar profile.